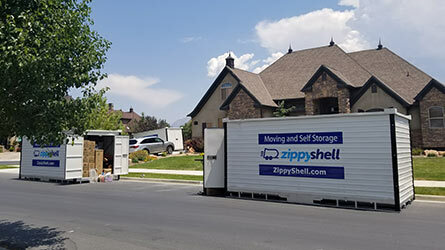 With Zippy Shell portable moving and storage containers, you never have to leave your driveway! Whether you need to store your belongings during a home renovation or want to move across the state, our portable units make it easy for you to pack up your items and move them to a different location. Zippy Shell Storage and Moving in Long Island provides a more convenient solution than traditional self storage. Our storage warehouses in New York are the most secure portable storage facilities in the industry. With traditional storage, you may need to pick up a truck, make multiple trips, then return that truck. With Zippy Shell, we bring our portable storage units to you, and pick them up at your convenience. Our goal is to make moving your belongings as simple and pain free as possible. Your belongings go into the storage container once, and stay in that container inside our secure warehouse facility. There is no need to unpack until we deliver it back to you. The best part is that Zippy Shell is generally more affordable than traditional storage! Do you have questions about our Long Island self storage services? Give us a call today at (631) 524-5450, we will be happy to help find the best solution for your needs! With Zippy Shell portable moving and storage containers you never have to leave your driveway! Voted "Best of the Best" by Dan&apos;s Papers in 2014. Long Island is one of the most diverse areas in America. Our customers use Zippy Shell to store items for their Hampton summer homes during the winter and then open them up for the summer social season. We move students in Stony Brook and help customers relocate to the calming towns of Brentwood, Smithtown, and Lindenhurst. Whichever side of the Island you’re on, we can help you find the perfect peaceful getaway from city life. Our Zippy Shell moving and storage team is comfortable driving across Long Island and into New York City. We can move you closer to Manhattan or across the country to California if you need it. Wherever you need to move, we can store and transport your items efficiently and safely. For more information, or to set up an appointment call 888-947-7974! today for more information and your free quote! Beat the Rush! Book today for the season's best savings!